According to its website, European Cancer Patient Coalition is the voice of cancer patients in Europe. With over 400 members, ECPC is Europe’s largest umbrella cancer patients’ association, covering all 28 EU member states and many other European and non-European countries. ECPC represents patients aﬀected by all types of cancers, from the rarest to the most common. ECPC is involved in the EU legislative health policy process. It provides a platform for EU citizens’ participation in the shaping and implementation of public health policies. It also aims to provide intensive cooperation between cancer patient groups and the European Medicines Agency (EMA) involving them in all possible procedures within EMA (e.g. 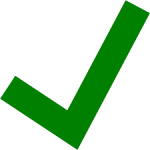 benefit/risk assessment in Scientific Advice procedures; Package Leaflets assessment; participation in Scientific Advisory Group in case of oncology). In addition, ECPC representatives participate in the meetings of Expert Group on Cancer Control of European Commission. Figure 1. European Cancer Patient Coalition website. Source: http://www.ecpc.org/about-us/vision-strategy. Accessed 02.09.2018. We are concerned that vulnerable cancer patients might be mislead into believing that Virotherapy Foundation and its promoted cancer treatment with Rigvir is proven and supported by European Cancer Patient Coalition. We also wonder how ECPC, which declares strict membership guidelines and code of conduct in contacts with pharmaceutical companies, could have made such an exception for Virotherapy Foundation. 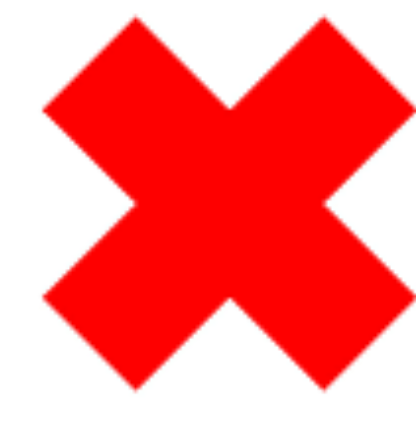 Every NGO cares for its image and attempts to prevent any potential damage to its reputation and trustworthiness, and such attempts may be harmed by affiliation with dubious actors. Virotherapy Foundation was created in Latvia in 2016 by the family of Aina Muceniece, the inventor of Rigvir, and it claims to fulfil her last will. At the first, very careless glance, it might appear to be a grassroots organisation, but in reality it functions as a front for Rigvir Group and caters primarily to the interests of a pharmaceutical company, not to the interests of patients. All the founders of this organisation are shareholders in Rigvir Group or its related companies. The Foundation advertises Rigvir as treatment for multiple cancers by hailing virotherapy as an effective and safe treatment, superior to other methods, criticises other therapies and oncologists who do not inform their patients about Rigvir, promotes testimonials of patients who used Rigvir, and suggests that patients go to another medical establishment, if they are not offered virotherapy. In a particularly flamboyant approach to advertising a prescription drug, the foundation even took cancer patients “who did not have much hope before they found virotherapy” and “were on the edge of death” on a mountain-climbing trip to Mount Blanc in France and used it to create an epic propaganda film, which in essence is a giant Rigvir advertisement. 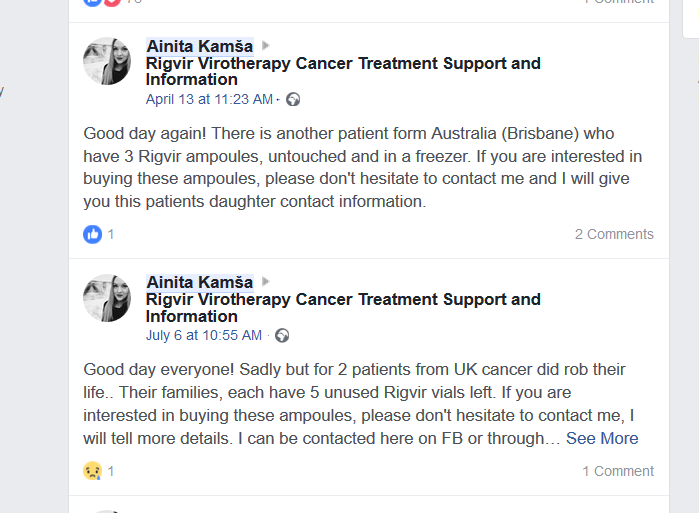 As if that were not enough, a representative of the Foundation has attempted to organise illegal and unsafe exchange of leftover Rigvir vials (which should always be stored at -20C degrees to maintain the alleged efficacy) in a cancer patient support group after the death of Rigvir users. Rigvir has no proper evidence of efficacy, i.e., not a single randomised-controlled clinical trial. It was mysteriously registered in State Agency of Medicines of Latvia in 2004, 2 days before Latvia joined EU. Both Latvian Oncologist associations have officially requested withdrawal of Rigvir from Medicinal Product Register of Latvia, reimbursed medicines list and national melanoma treatment guidelines due to insufficient evidence. Rigvir is illegally advertised for off-label use to treat numerous cancers without any evidence from clinical trials and despite punitive action from national regulatory institution. Numerous partnerships with alternative cancer clinics in Germany, Mexico, Spain and other countries have been established (e.g., 1, 2, 3, 4, 5, 6, 7, 8, 9, 10, 11, 12). Medical Director of Rigvir holding simultaneously serves as the Chief Oncologist of the Latvian Ministry of Health and advisor to the Minister of Health, causing a conflict of interests. 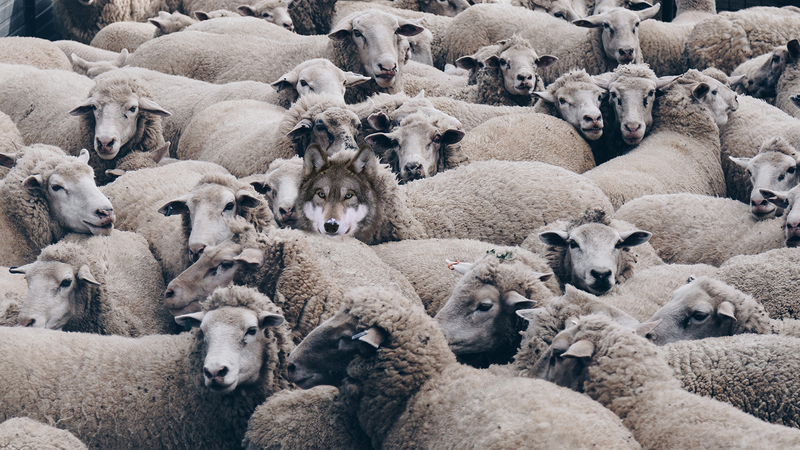 Rigvir and its manufacturer’s practices may not be very well known in wider European circles, but unfortunately there seem to be ongoing attempts to convince more and more patients abroad about its legitimacy and efficacy. There has been an attempt to introduce it in a private Slovenian clinic despite objections from Human Rights Ombudsman, and recently Italian Association for Cancer Research (AIRC) had to publish a warning article (automated translation here) about virotherapy and Rigvir in the “Disinformation” section of its official website, mentioning Italian patients who fall for aggressive online advertising, travel to Latvia and spend significant amounts of money for this unproven treatment. Figure 3. 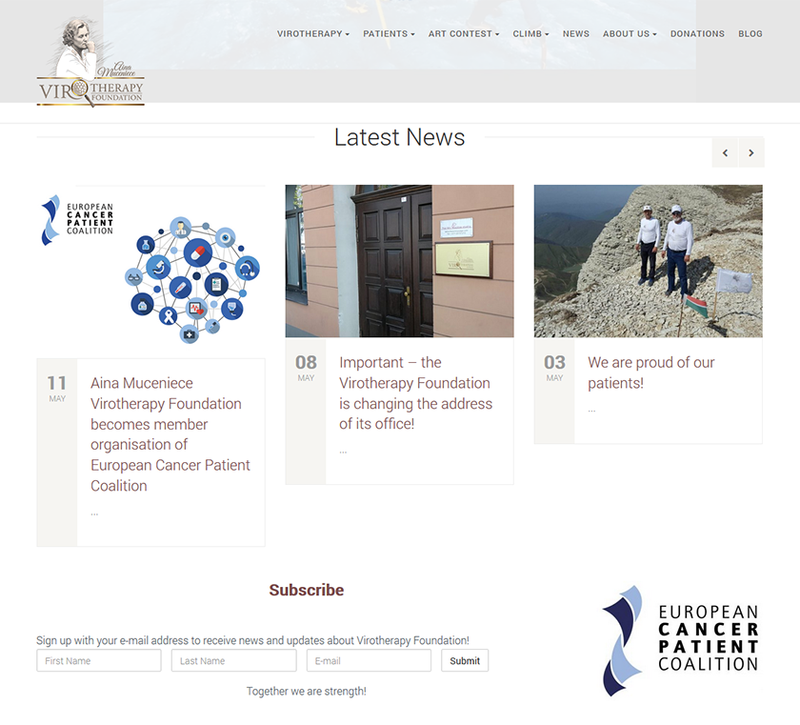 Screenshot of Aina Muceniece Virotherapy Foundation website. Source: https://www.virotherapyfoundation.org/en/about-us/ Accessed 02.09.2018. 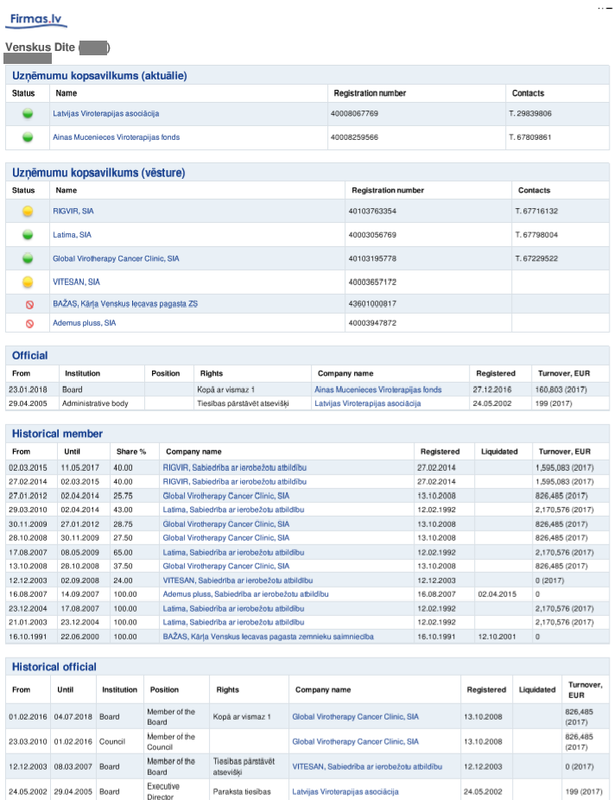 European Cancer Patient Coalition surely appears to be a legitimate and highly respectable non-governmental organisation with laudable goals, wide reach and ability to influence discussions, awareness campaigns, policy-making, scientific research and representation of cancer patients in various levels in European Union. Membership in such a respectable organisation would certainly improve the credibility of Virotherapy Foundation in the eyes of the patients and provide the foundation with lobbying opportunities on an international level. Therefore, the motivation for the Virotherapy Foundation to be a member of ECPC is rather clear. What is less clear, however, is how Virotherapy Foundation could have possibly become a full member, considering ECPC’s high standards regarding transparency of financial sources and conflicts of interest in non-governmental organisations. d. The organization must be demonstrably independent of authorities, political parties, the pharmaceutical industry and commercial organizations. Virotherapy Foundation breaches two out of four requirements, if not three. A. The organization must be registered in a European Union member state as a non-profit legal entity. The legal status of Virotherapy Foundation in Latvia is “nodibinājums” or “foundation”, which is generally a non-profit entity. This seems to be the only requirement this organisation fulfils. B. The organization’s main constitutional objective must be to promote the interests of cancer patients and/or their caregivers, or cluster of cancer patient organizations in the European Union. Since Aina Muceniece’s virotherapy is one specific pharmaceutical product and prescription drug Rigvir, the self-defined main mission is already at odds with ECPC requirements, as it aims to promote a specific treatment. C. The majority of those responsible for managing the organization must be cancer patients. None of the founders or representatives of the Virotherapy Foundation have publicly claimed to be cancer patients or survivors. Virotherapy Foundation fails this requirement utterly and completely. As noted in Foundation’s website, Aina Muceniece Virotherapy Foundation was established by Aina Muceniece’s daughter Dite Venskus, granddaughter Katrīna Pumpuriņa, grandson Jurģis Auziņš, and great grandson Kristaps Reinholds. They are all shareholders of Rigvir.Ltd or its affiliated companies. 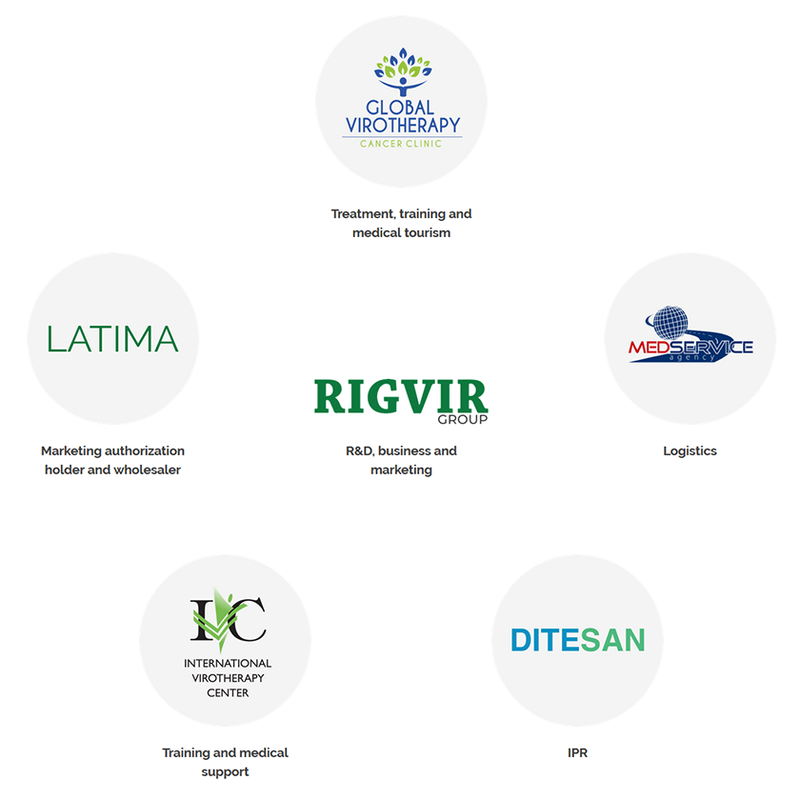 Rigvir Group entails several companies – the manufacturing company and licence holder SIA Latima, single-drug treatment facility Global Virotherapy Cancer Clinic, patent holder SIA Ditesan, transport company MedServiceAgency.eu, and International Virotherapy Centre. Figure 5. Rigvir Group companies. Source: https://www.rigvir.com/our-company/company-structure.php. Accessed 02.09.2018. Jurģis Auziņš is majority shareholder of Rigvir.Ltd and the company’s CEO. Dite Venskus has owned shares in Rigvir.Ltd and, at the time when Virotherapy Foundation joined ECPC, she was still a member of both the board and the council in Rigvir-owned Global Virotherapy Cancer Clinic. Katrīna Pumpuriņa still owns shares in Rigvir.Ltd. Kristaps Reinholds is a current member of the board in aforementioned Global Virotherapy Cancer Clinic and former member of board in SIA Oncoimmunology, another clinic that treats exclusively with Rigvir. Figure 6. Current shareholders of Rigvir. Source: www.firmas.lv company database. Accessed 09.08.2018. Figure 7: Historical shareholders of Rigvir. Source: www.firmas.lv company database. Accessed 09.08.2018. Figure 7.a. Historical posts and memberships of Dite Venskus. Source: www.firmas.lv. Accessed 09.08.2018. Figure 7.b. 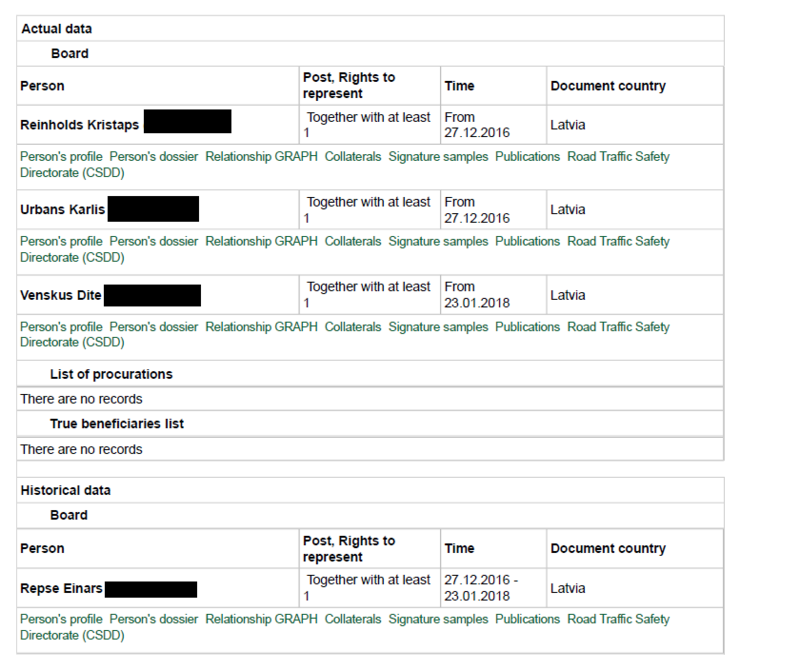 Actual and historical posts and memberships of Kristaps Reinholds. Source: www.lursoft.lv. Accessed 02.09.2018. Upon looking at the Board of Virotherapy Foundation, one also finds Karlis Urbans. Unsurprisingly, he also happens to be the Head of Business Management at Rigvir Group. Figure 8. Current and former board members of Virotherapy Foundation. Source: Lursoft company database. Accessed 02.09.2018. As to financial sources of the Virotherapy Foundation, there are no income reports or statements on its website, only instructions about donating to this organisation. 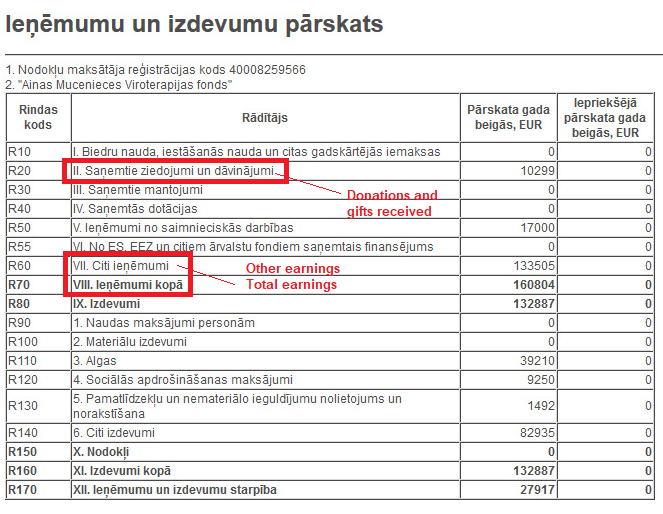 An official, state-required financial report for 2017 can only be found in Lursoft.lv database (behind a paywall and only in Latvian), where total earnings are listed as €160 804. Unspecified “Other income” constitutes €133 505, and total amount of donations has only reached €10 299. Only two donors are listed: Andrejs Nollendorfs, another shareholder of Rigvir, and International Virotherapy Centre, a Rigvir Group enterprise. Since there are no donations that are not affiliated with Rigvir and there is no transparency about income sources, one can only conclude the obvious – this is not an independent organisation. Figure 9. Financial report of Virotherapy Foundation, 2017. Source: www.lursoft.lv company database. Accessed 02.09.2018. The statutes of ECPC also require the new member organisations to be politically independent from political parties. Unfortunately, the Foundation fails this requirement as well. Ainita Kamša currently is the Executive Director and the public face of Virotherapy Foundation. She represented it in a recent ECPC Congress (where the previously mentioned film about cancer patients using Rigvir was shown). She also happens to be a member of Latvian political party “Latvijas Attīstībai”, its youth section’s coordinator of foreign affairs, and even a candidate in parliament elections this upcoming October. A founding member of the same political party, Einars Repše, is the current Honorary President of the Virotherapy Foundation. He is a former Prime Minister, Minister of Finance, Minister of Defence, president of Bank of Latvia, and a generally well known politician in Latvia, therefore it is not clear how a foundation run by two politicians could be considered unaffiliated with political parties. In addition, the political history and ties of the “very honorable public person, former Prime Minister and former president of Bank of Latvia” Einars Repše seemed to be a positive motive for the Foundation, praised by one of Rigvir Group companies. Mr. Repše was specifically invited to take on this position, which creates the impression that the purpose of his assignment was never a functional one, based on experience in protection of patients’ interests or work in non-governmental organisations, but rather one motivated by high PR visibility due to previous role in politics. Figure 10. ECPC Membership Application Form template. Source: http://www.ecpc.org/about-us/our-members. Accessed 02.09.2018. We hope that this information will be seriously evaluated and that ECPC will respond to our post to clarify and remedy this situation. In the interest of transparency, it would be appreciated if the full member admission form, submitted by Aina Muceniece Virotherapy Foundation, could be revealed, and if ECPC could provide a comment on the legitimacy of its full member status and further actions to be taken, if ECPC finds it statutes breached. Previous Previous post: What is Rigvir and what are the claims made about it?